Global passenger-vehicle production for 2013 is forecast to be about 82 million units (Source: Market watch). 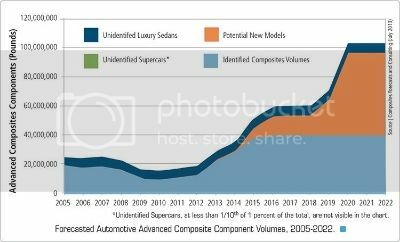 Of this total, luxury cars (Including super and hyper cars) account for about 9 percent: Making up these 8 million cars are approximately 210 models. Somewhat surprisingly, about 100 current or anticipated new models make some use of Carbon Fibre Reinforced Plastic (CFRP) - nearly four times as many as 10 years ago! In July 2013 "Composites forecasts and consulting" estimated that the total weight of CFRP components will grow from 7,486 metric tonnes in 2013 to 16,334 metric tonnes in 2016; and by 2022 the total weight of carbon composites going into cars annually could exceed 45,360 metric tonnes. To support the manufacture of 45,360 metric tonnes of finished CFRP parts, the automotive supply chain will require nearly 39,225 metric tonnes of raw carbon fibre. Today the auto industry (including race car teams and aftermarket accessory vendors) consumes about 3.5 percent of the global carbon fibre production capacity. Faced with a steady global increase from aerospace, automotive, marine, wind energy and luxury/ sporting equipment manufacturers, supply of carbon fibre may well fall short of demand in the years to come. Whilst reducing the pressure on virgin material production, recycled carbon fibre could also reduce overall material costs: and for vehicles priced less than $120,000 with production volumes greater than 20,000 units per year, the use of recycled carbon fibres will be critical in curtailing rising production costs. Requiring less petroleum-based feedstock, recycled carbon fibre also adds an extra green dimension to CFRP solutions. 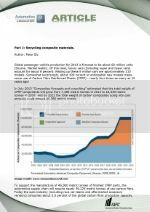 However at present there are very few commercial recycling operations for main stream composite materials, due to technological and economic constraints. Composites are by their very nature mixtures of different materials: polymer, fibrous reinforcement (glass or carbon fibre) and in many cases fillers (these may be cheap mineral powders to extend the resin or have some other function, such as fire retardants). There are few standard formulations and for most applications the type and proportion of resin, reinforcement and filler are tailored to the particular end use. Technically, composite recycling is hindered both by the fibre and other types of reinforcement, and by matrix or binders. Thermoset materials are particularly difficult to recover. 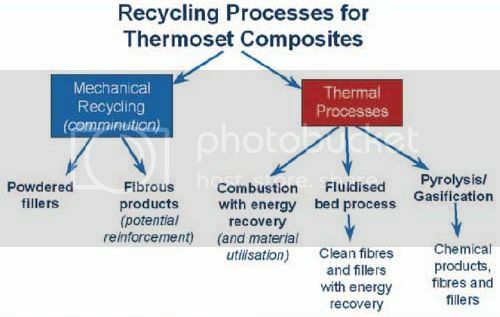 The problem with recycling thermoset composites is that thermosetting polymers are cross linked and cannot be remoulded, in contrast to thermoplastics which can easily be remelted. However, certain thermosetting polymers, such as polyurethane, can also be converted to their original monomer. Nevertheless, the more common thermosetting resins, such as polyester and epoxy are not practical to depolymerise to their original constituents. Because of these challenges, most of the recycling activities for composite materials are limited to energy or fuel recovery with limited materials recovery for reinforcement fibres or resins. Environmental legislation such as the EU-directive for end-of-life vehicles has resulted in an increased demand for recycling techniques that realize true material recycling. To this end extensive R&D has produced three major recycling technologies: mechanical recycling, thermal recycling, and chemical recycling. • Mechanical recycling involves shredding and grinding of the base material, followed by screening to separate fibre-rich and resin-rich fractions for re-use. This is energy-intensive and the recycled fractions are not of a high quality. • Thermal processing uses high temperature (between 300 and 1000oC) to decompose the resin and separate the reinforcement fibres and fillers. Clean fibres and inorganic fillers are re-generated, and secondary fuel or thermal energy can be produced through pyrolysis, gasification or combustion. However, the quality of the recovered fibres and filler materials deteriorates during the thermal process. • Chemical recycling aims at chemical depolymerisation or removal of the matrix and liberation of fibres for further recycling by using organic or inorganic solvent. Lack of flexibility and the creation of waste chemicals resulting in environmental concerns have slowed active development of this technology. However a cleaner process, based on near- and super critical fluid technology (in particular water) has rekindled interest in this process. Due to their relatively high cost, the recovery of carbon fibres is at the forefront of composite recycling. The objective of the MAI Carbon Research cluster recycling project is to establish a complete recycling process chain for production rejects, complex mixed materials, and reprocessed carbon fibres that are suitable for reuse in various products. The project partners include Audi, BMW, SGL Carbon, Neenah-Gessner, Voith Composites, the Fraunhofer Institute for Building Physics, and the bifa environmental institute. As a member of the cluster Siemens Corporate Technology has developed a solvolysis recycling procedure whereby the resin component is heated under pressure at a temperature of 200 degrees Celsius and converted to low molecular-weight, soluble alcohols with the aid of water. No environmentally damaging solvents are used in the process, which also requires much less energy than would be required to manufacture new fibres. The woven fabric recovered from the donor component retains its shape and the fibres remain intact, thereby facilitating further processing. What’s more, the fibres' mechanical properties are almost fully retained. Also conducting research into recycling composites is the collaborative project CAMISMA (carbon fibre-amid-metallic structural interior component using a multi-material approach), supported by the German Federal Ministry of Education and Research. A leading member, Evonik Industries AG, is developing a fully automated continuous process known as "in situ polymerization," which takes reclaimed carbon fibre and combines it with heated polyamide 12 (PA 12) monomer tweaked with a proprietary initiator. The result is a nonwoven tape that Evonik calls an "organic sheet." According to Dr. Matthias Berghahn, who is responsible for the project at Creavis, the strategic research and development unit of Evonik Industries: "Because only a monomer is used, not a polymer resin, the viscosity is very low and, therefore it’s possible to fully wet out the fibres as the monomer polymerizes during the process." "This is different from a traditional powder coating or a hot-melt system," he adds. "This way, we get fast coating of the fibres for better tape production throughput, and good, void-free mechanical properties because fibre wetout is so complete and independent of the sizing of the waste fibres." Component preforms can be created from the organic sheet (or tape), then heated and placed in a mould. Through the application of heat and pressure the parts are then cured. To meet functional requirements two types of tape are in development: a unidirectional product made with off-spec yet good-quality fibres, and a random nonwoven, made entirely from recycled fibres. As OEMs search for ways to reduce vehicle weight in order to meet emissions legislation composite materials, and in particular fibre reinforced plastics, are being used in ever increasing numbers. Notwithstanding end-of-life legislative requirements it also makes good economic sense to recycle composites, particularly high value materials such as carbon fibre and certain aramides. However in many cases degradation of the materials’ integrity during the recycling process may mean that, for now, the reclaimed material may need to be repurposed for an application requiring less mechanical strength than the original. Y. Yang, et al. - Recycling of composite materials, Chem. Eng. Composites World - Recycling carbon fibre back into the automobile. Siemens Corporate Technology – Solvolysis to recycle composites. SJ Pickering (School of Mechanical, Materials and Manufacturing Engineering, The University of Nottingham) - Recycling technologies for thermoset composite materials.